This has, most definitely opened my eyes about the potentials of Jell-O flavoring. 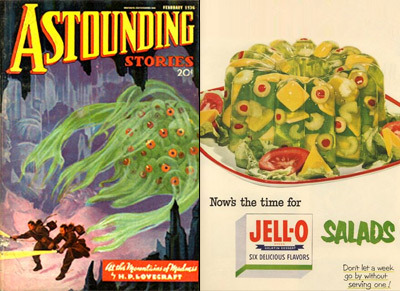 The SocImages post about Aspic was also interesting, because they look like weird foods you’d find in a dream. Not that I’m about to develop a craving for any of those gross looking preparations, but, as a culture, we put so many otherwise revolting combinations of food and drink into our mouths, without giving it a second thought, everyday. I always knew that stuff was pure EVIL. OMG SHUT UP I LOVE JELL-O SALAD!!!! Irene, I’m with you. That stuff id deee-lishus! I made no disparaging remarks regarding the Jell-O salad! Though I don’t find it delicious so much as…. HYPNOTIC.